If you are a busy Mom on the go, or if you are a woman in a hurry with a last minute date to attend and don't have time to do your nails, do not panic, we have found a quick fix for your Beauty SOS, that will definitely change the way you do your nails forever in an economic, safe and beautiful way. We have put it to the test and this is what we have found. imPRESS is a press on manicure system that will give you a salon-quality manicure, with a sophisticated nails look that you can vamp up with a bold glitter accent, best of all you don't need any DIY skills. Just press on, and with no dry time you can get right back to life’s demands. Its UltraHold technology keeps nails on until you’re ready to remove them, just peel off without any damage to your natural nails. The innovative PSA, (Pressure Sensitive Adhesive), eliminated key barriers such as nail damage, ease of application, and product reliability while UltraHold™ technology introduced a safe-on-nails adhesive, ending the need for glue and acetone-soak removal. ImPRESS is perfect for women with busy schedules and younger women who can’t afford weekly salon visits. Women in every generation enjoy imPRESS Manicure because there truly is something for everyone. On-the-go moms no longer need to spend time and money at a nails salon, they have a collection of nail styles that go from the french manicure to elaborate designs. imPRESS Manicure has a variety of nail moods that will suit you, from soft hues to bold glitter tips, on-trend accent nails, all with an ultra-gel shine, perfect for every moment. You can rely on imPRESS Manicure as an alternative to nail polish getting a salon-quality manicure that you can achieve easily at the convenience of your own home and on your own time. Simply peel backing and press on. No drying time or smudges, no dings and no mess. Safe on natural nails. Mega gel shine finish. Its UltraHold™ Technology keeps your nails on. 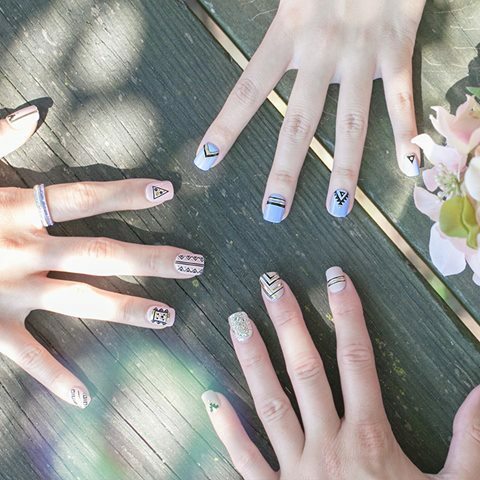 You can dress up your nails with the latest nail trends from imPRESS Manicure. Through innovation and a revolutionary technology, imPRESS Manicure initiated a new category and developed into a standalone brand.